How to make the best kid and adult friendly chicken nuggets at home. These nuggets are so easy, and you only need three main ingredients to make them! 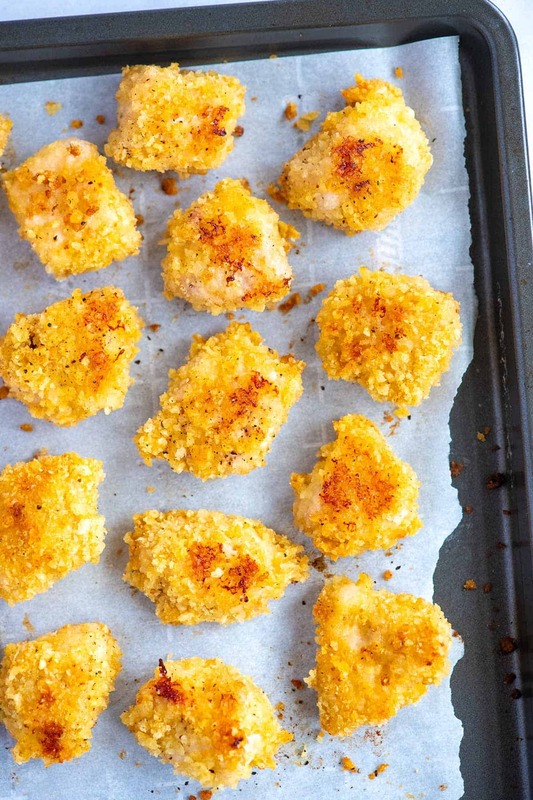 Jump to the Easy Baked Chicken Nuggets Recipe or read on to see our tips for making them. Unlike the restaurants and fast-food eateries, we bake these homemade chicken nuggets instead of frying them. 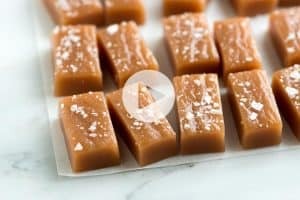 They are easy to make, too! The traditional way to make chicken nuggets is to bread them by following a three-part process. You would dredge in flour, then into egg, and finally, coat in breadcrumbs. 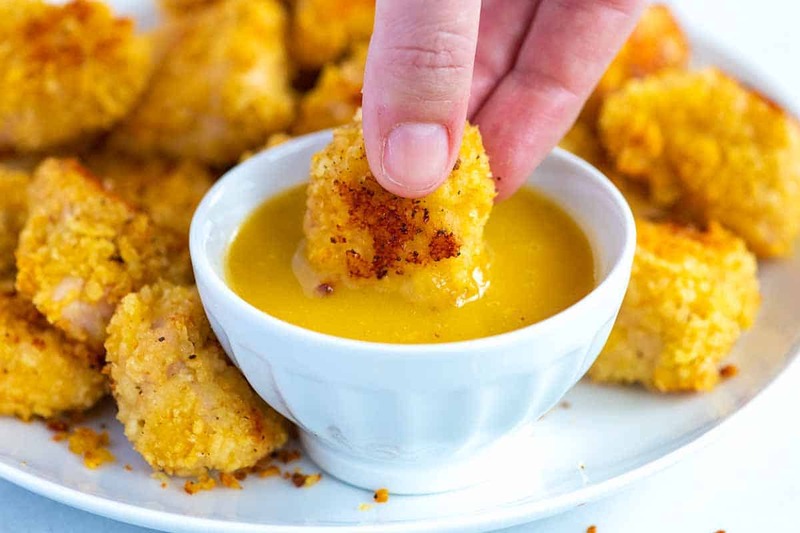 This method makes great chicken nuggets, but we’ve found another way! 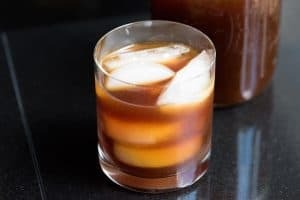 It’s easy and tastes amazing. Instead of using flour and breadcrumbs, we use potato chips. You can use any brand or flavor of potato chip you like (you can even use the baked varieties). We love how crunchy kettle cooked potato chips are, so we usually reach for those. I especially love using dill pickle flavored chips, but that’s me. You can use whatever flavor you love. Think about barbecue, buffalo, salt and vinegar or even plain salt. Bonus: since we are using potato chips for these, they are gluten-free if you choose a gluten-free flavor! If you love these nuggets, take a look at our Crispy Flaky Homemade Fish Sticks recipe. They are so simple! 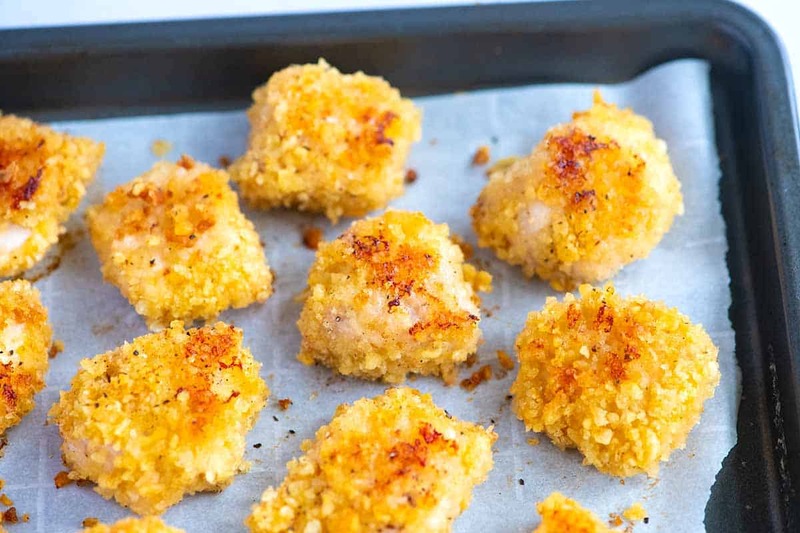 Cut boneless, skinless chicken into nugget-sized pieces. In our photos, we used chicken breast, but chicken thighs would be excellent. Dip the chicken into a whisked egg. We use the whole egg, but for fewer calories, use egg whites. Roll into crushed potato chips until well coated. 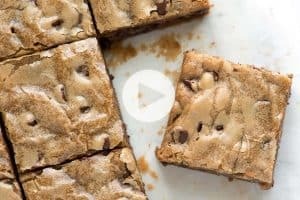 Place onto a baking sheet and bake until crispy. I told you these chicken nuggets are simple. We love to serve them next to honey mustard dipping sauce, but ketchup or buffalo sauce work, too. How to make oven-baked potato wedges that are perfectly browned and crisp on the outside and tender on the inside. How to make tater tots at home without frying. These homemade tater tots are baked, not fried so they are easy. Baked sweet potato fries that are caramelized and crispy on the outside and tender on the inside. No fryer needed here. Kid and adult friendly homemade baked chicken nuggets. 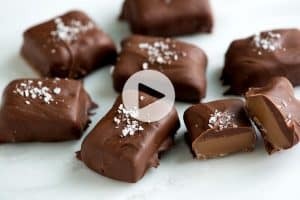 They are so easy, and you only need three main ingredients to make them! Heat the oven to 400 degrees Fahrenheit. Line a baking sheet with parchment paper, foil, or a silicone baking mat. Add the chips to a resealable bag then use a rolling pin to crush them into crumbles. Alternatively, add the chips to a food processor and pulse until crumbled. Add potato chip crumbles to a wide bowl. Beat the egg in a separate bowl. Cut the chicken into 1-inch pieces (about 24 pieces). Then with one hand, dip a piece of chicken into the beaten egg. Shake any excess egg off to prevent soggy nuggets. Then, with your other hand or kitchen tongs, roll the chicken into the crushed potato chips and place onto the prepared baking sheet. Repeat with remaining pieces of chicken. Spray tops of the chicken with nonstick cooking spray or add a light drizzle of olive oil to the tops of the nuggets. Bake for 15 minutes, flip the chicken and then bake until an internal thermometer inserted into the chicken reads 165 degrees F, and they are no longer pink inside, another 8 to 12 minutes more. Serve with your favorite dipping sauce. One egg is usually enough for coating the chicken. If, however, you run out of the egg, add a second one to the bowl. For even crispier chicken nuggets, insert a wire baking rack into a rimmed baking sheet. Then, instead of baking the chicken directly on the baking sheet, bake them on top of the wire rack. Since air flows around the chicken, there is no need to flip the chicken. 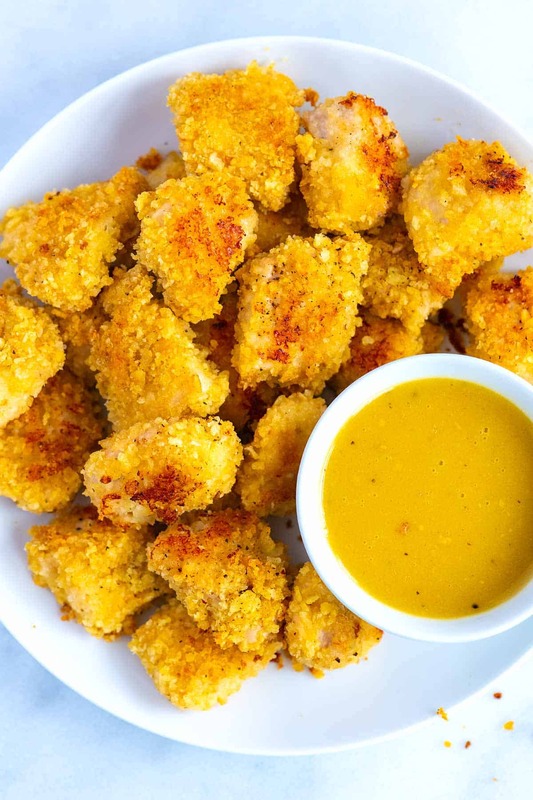 Make-ahead chicken nuggets: Make the nuggets by following the recipe above. Let them cool then freeze up to a month. To reheat, place them from frozen in a 400F oven and bake until crisped up and hot throughout, 10 to 15 minutes. Recipe inspired by Gimme Some Oven.